There are so many things to do at The Village at Grand Traverse Commons—from shopping to hiking—but eating at one of the Commons’ restaurants should definitely be on the to-do list. From simple tacos to upscale Italian, there are plenty of options, including breakfast, lunch, and dinner. 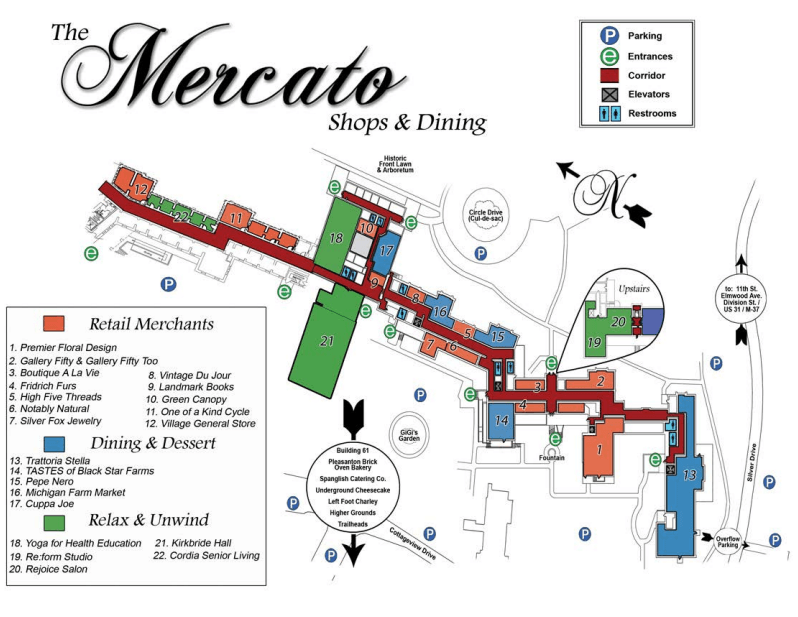 The Commons’ eateries are located at the Mercato inside Building 50 (the campus’ anchor) and also in smaller surrounding buildings—check out the maps at the bottom of this page. With a view overlooking the front lawns of Grand Traverse Commons, Cuppa Joe is a great place to grab a cup of coffee in the morning after a walk around the grounds. Cuppa Joe also offers free WiFi and a full menu that includes soups, salads, and sandwiches. The entrance to Cuppa Joe is inside the Mercato, near the Commons’ front lawn, at the western end of 11th Street. Tucked away near Spanglish and sharing a building with Left Foot Charley west of Building 50, this coffee shop and roastery is loved by local coffee aficionados and tourists alike. Higher Grounds is committed to sustainability, and their organic coffee is made in small batches. 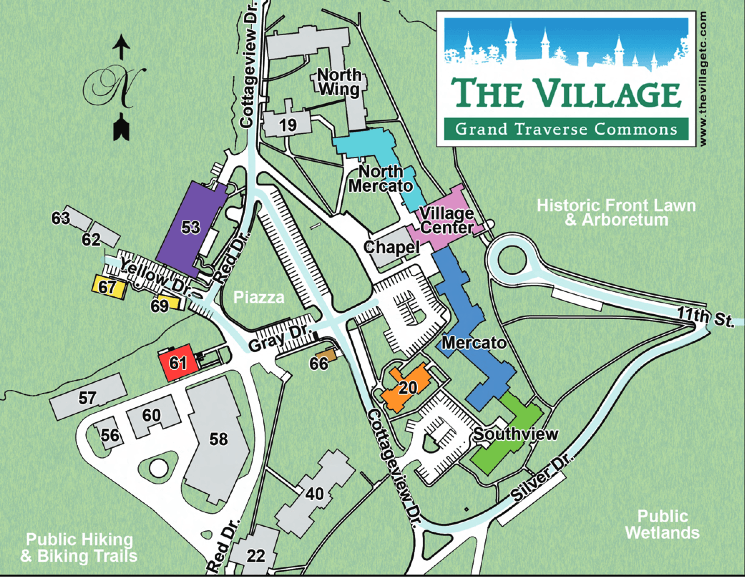 Grab a cup of coffee before heading out to the hiking trails behind Grand Traverse Commons. Keep an eye out for concerts hosted in Higher Ground’s roasting room. With its distinctly urban feel and prime location as the area’s closest winery to downtown, Left Foot Charley is a fun place to sip a glass of white wine or cider after a long day at work (or the beach). They also have some awesome happy hour specials with dishes from around the world, and the Wednesday open mic nights feature tasty tunes from Northern Michigan singer-songwriters. If you’re in the mood for Moomers Ice Cream (and honestly, who isn’t?) or another Northern Michigan treat to satisfy your sweet tooth, stop by the Mi Farm Market and pick up an armful of delicious Michigan-made goods. Their products, which include gift baskets stuffed with locally made fudge, popcorn, and jams, make great gifts and savory souvenirs. An Italian from-scratch eatery that serves simple and fresh food, this is a delicious place to stop for lunch or dinner. Try the Ravioli al Quattro Formaggi al Ragu di Funghi (translation: a four-cheese ravioli with mushroom meat sauce). PepeNero is located in the Mercato. A great place to satisfy almost any craving, Pleasanton has sweet and savory pastries, to-die-for tarts, and brick oven pizzas. Named by Food and Wine Magazine as one of the best bread bakeries in 2012, its offerings are both accessible and elevated. Pleasanton is located in a charmingly small, brick building near Spanglish and Left Foot Charley. Jamie and Andrew quit their day jobs and started one of Traverse City’s newest breweries in late 2016. Currently offering four year-round brews and several seasonals, Jamie and Andrew like to brew beer with a sense of place. “Our beers help us tell our story, and we share that with our customers through each pint,” Jamie says. Outside food is welcome at Earthen Ales, so snag a snack from neighboring Spanglish or Pleasanton, then settle down and choose a great Northern Michigan ale to pair it with. 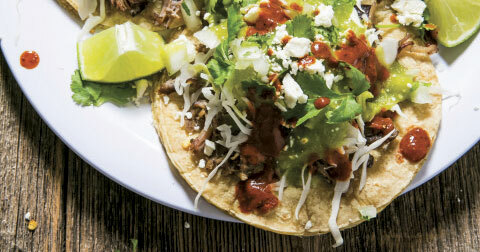 Spanglish’s menu—consisting of tacos, quesadillas, tomales, and burritos—is deceptively simple. Their food is fresh and full of flavor. Grab a few tamales or tacos and sit outside at one of the many picnic benches in the area. Spanglish is located in Building 69, just south of Left Foot Charley and Higher Grounds. Red Spire just opened in January 2017. Offering classic egg dishes, omelets, specialty benedicts, red velvet pancakes and unique French toast alongside fresh salads, delicious sandwiches, gourmet macaroni and cheese and daily-baked homemade cinnamon and pecan rolls, the menu at Red Spire is designed with both breakfast and lunch in mind and will adjust seasonally. This much-heralded neighborhood restaurant is set in a cellar-like space beneath Building 50, and is perfect for everything from a romantic evening to a fun night out with friends. Frequented by locals and loved by tourists, the food is Italian-inspired, and, most importantly, delicious. 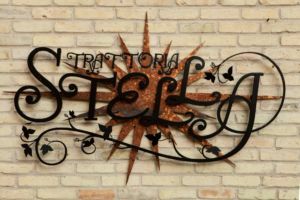 Trattoria Stella was even featured in The New York Times for its chill atmosphere, locally-focused, extensive wine list, and thoughtful cocktail selections. The perfect place to quell a mid-afternoon chocolate craving, the Undergound Cheesecake Company is famous for their cheesecake on a stick—for good reason. Grab everything from brownies to cookies to, of course, cheesecake. Try the to-die-for chocolate cake with cream cheese frosting.